New human rights award: music to our ears! On 7 December 2017 Cherie Hu reported in Billboard that the United Nations High Commissioner for Human Rights will award the inaugural High Note Music Prize next year to a major recording artist in recognition of outstanding contributions to humanity and the promotion of human rights through music. The High Note Music Prize selection committee, which is in the process of being assembled, will work with the Office of the High Commissioner for Human Rights to select an international artist who has promoted human rights for at least a decade, a spokeswoman tells Billboard. The annual award will be presented in fall 2018 during the High Note Honors Concert in London. Proceeds from the concert and its worldwide broadcast will benefit the UN Office of the High Commissioner for Human Rights, the Grammy Museum and the prize winner’s social justice charity of choice. The award will soon be added to THF’s Digest of Human Rights Awards: http://trueheroesfilms.org/thedigest. The High Note Music Prize is part of the High Note Project, a new global social justice initiative launched by philanthropic producer David Clark. Clark previously collaborated with Nelson Mandela on the 46664 series of charity concerts in support of HIV/AIDS, featuring performances by the likes of Bono, Beyoncé, Queenand The Eurythmics. Clark is an executive producer of the project as is Chantel Sausedo, whose other credits include producing the Grammy Awards for TV, the Laureus World Sports Awards and In Performance At The White House specials. Stuart Galbraith, CEO and founder of Kilimanjaro Live — the U.K. promoter behind heavy metal festival Sonisphere and the U.K. and European legs of the Vans Warped Tour — will be co-producing the Honors Concert in London. “We’re both pleased and proud to have been selected as the promoter of the High Note Honors Concert, which will be a significant global event for music and the artists of our time that are passionate about making a difference in the lives of others,” Galbraith said in a statement. During the concert broadcast, the prize winner’s selected charity will also benefit from a Cause Flash social media campaign that aims to reach over 1 billion people worldwide. Conceived by Clark, Cause Flash was the digital platform behind Water Now, a social media campaign in support of UN World Water Day in 2015 that reached over 800 million people in seven days, marking the largest such campaign in history. GRAMMY-nominated singer and social justice advocate Andra Day, whose song “Rise Up” became an anthem for the Black Lives Matter movement, has also voiced her support for the Project: “I admire the mission of High Note and its decision to recognize musicians for their contributions through song”. On 20 November 2017 (as hoped see: https://humanrightsdefenders.blog/2017/11/01/20th-anniversary-of-un-declaration-on-human-rights-defenders-starts-with-crucial-draft-resolution-in-the-ga/) the UN Third Committee of the UN General Assembly in New York unanimously endorsed the free and independent role of human rights defenders at the UN. ‘The international community has sent a strong signal. Human rights defenders have a key role to play in strengthening respect for human rights all around the world,’ said Norwegian Minister of Foreign Affairs Ine Eriksen Søreide. Norway, which chaired the negotiations, managed to get 76 countries to co-sponsor the draft resolution, which was developed in close consultation with civil society. In view of the importance of the resolution I attached the full text which also has the list of co-sponsoring countries. The resolution condemns the criminalization, curtailing and killing of human rights defenders. It calls for the release of all those who have been imprisoned for exercising their right to freedom of speech and other fundamental freedoms. This is the first time that UN Member States have unanimously agreed to send such a clear and powerful message on the need to protect human rights defenders. In order to build on this important development, the UN will convene a high-level meeting on the situation of human rights defenders, and the UN Secretary-General has been requested to strengthen the UN’s role in protecting human rights defenders. All this in the context of the 20th anniversary of the UN Declaration on Human Rights Defenders next year. Decides to remain seized of the matter. Resolution 2200 A (XXI), annex. See Official Records of the General Assembly, Sixty-eighth Session, Supplement No. 53 (A/68/53), chap. IV, sect. A. Ibid., Seventy-first Session (A/71/53), chap. IV, sect. A. Ibid., Seventy-second Session (A/72/53), chap. IV, sect. A. And forward this Note to others who should know about it!! Please send information before 30 June 2015 by email to: civilsociety@ohchr.org, with in the subject heading “Civil Society Space Report – Input”. Consultation – updated 21 April 2015.doc – Google Docs. “We are very concerned by developments in Burundi over the past two days, and call on all armed forces and non-state actors to refrain from taking actions which may endanger the lives of civilians and to ensure their protection from the effects of conflict. There is a clear risk that the instability may be prolonged, or even made worse, if there are violent reprisals. We have received reports of numerous attacks on both private and state media with radio and television stations destroyed, endangering the lives of the journalists who were still inside them at the time. We call for a re-opening of all media outlets and the respect of the independence of journalists. There is also an urgent need to ensure the safety of human rights defenders and journalists. To give just one example, one of Burundi’s most prominent human rights defenders, Pierre-Claver Mbonimpa [Laureate of the MEA in 2007 – ed], has had to go into hiding after receiving death threats. Those who incite or engage in acts of mass violence are liable to be prosecuted by competent judicial bodies, as reflected in the recent statement by the Chief Prosecutor of the International Criminal Court. via OHCHR PRESS BRIEFING NOTE – (1) South East Asia / migrants boats (2) Burundi (3) International Day against Homophobia & Transphobia » Press releases » News – StarAfrica.com – News – StarAfrica.com. On 17 October 2014 the United Nations High Commissioner for Human Rights felt duty bound to express deep concern about a criminal case initiated by the Supreme Court of the Maldives against members of the country’s own official Human Rights Commission! 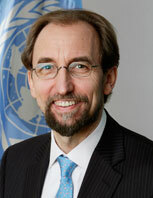 The Office of the High Commissioner for Human Rights (OHCHR), noted that five members of the Human Rights Commission of the Maldives were now facing “serious criminal charges” following the submission of their written contribution to their country’s second Universal Periodic Review (UPR), presented to the UN Human Rights Council (the actual UPR of the Maldives is scheduled to be held between April and May 2015). “The Government has a responsibility to ensure a safe operating space for the Commission and for civil society actors in the country, so that they are able to coöperate with UN human rights mechanisms without fear of reprisals.” the spokesperson stated. United Nations News Centre – Maldives: UN ‘deeply concerned’ as Supreme Court prosecutes rights advocates. On 8 September 2014 the new UN High Commissioner for Human Rights, Zeid Ra’ad Al Hussein, addressed for the first time the Human Rights Council, and many will have been listening for clues about where he stands on key issues, how ‘activist’ he is likely to be etc. As the speech was rather long and covered a huge variety of issues, it is not easy to draw any conclusions yet. The fist half addressed issues of war and violence and in particular the humanitarian crises of today. halt the increasingly conjoined conflicts in Iraq and Syria. In particular, dedicated efforts are urgently needed to protect religious and ethnic groups, children – who are at risk of forcible recruitment and sexual violence – and women, who have been the targets of severe restrictions. See full text at: Media Centre.